Kidney stones affect more than 10% of Southern Californians. The result of mineral deposits which form and harden in the kidneys, these small stones can cause not only severe pain, but result in lasting health problems if not treated by an expert urologist. Here's everything you need to know about kidney stones and various kidney stone treatments by Dr. Gary Bellman at the Southern California Urology Institute. If you're suffering from a kidney stone, you may not know what is responsible for your pain and discomfort, but you're sure going to notice it. Southern Californians with large kidney stones may experience abdominal or kidney swelling, when stones begin to block the flow of urine. Inflammation and swelling surrounding the kidneys near the lower back on both sides of the body, or swelling near the groin may also be symptoms of kidney stones. Pink, red, or brown urine is a symptom that you've developed kidney stones which have grown and are starting to block the urethra. This can lead to tinges of blood in your urine (known as hematuria). It's important to consult a top Los Angeles urologist if you notice blood in your urine. Southern Californians who leave kidney stones untreated, can typically develop a urinary tract infection, which brings about fever and/or chills. Southern Californians who develop kidney stones can describe an overwhelming persistent urge to urinate. Urination is also frequently accompanied by pain, which will occur if the kidney stone is moving from the bladder into the urethra. Should kidney stones continue to grow large enough, Southern Californians will find sitting or even laying down terribly uncomfortable, due to pressure put on the body. If you're unable to get comfortable sitting or lying down, it is critical that you visit an expert Los Angeles urologist as soon as possible. Kidney stones make some Southern Californians so nauseated that they will vomit. Vomiting from severe pain is also not uncommon. Nausea and vomiting can also occur when a kidney stone is disrupting the kidneys' ability to filter toxins and dispose of waste. Pain particularly in the side and back, just below the ribs where the kidneys sit is a common symptom that you have kidney stones. The pain may also spread from the lower abdomen to your groin and into your back. Kidney stones were at one time microscopic particles, which over time band together, and harden, turning into "stones." Once these deposits have crystallized, it becomes much harder for them to dissolve in the urine. So, they pass out of the kidney and become lodged in the tube that carries the urine to the bladder. The resulting pain is from a blockage of urine, pressure, and ultimately stretching, and spasms. Calcium stones are the most common type of kidney stone and occur in two major forms: calcium oxalate and calcium phosphate. Calcium oxalate stones are much more common. Calcium oxalate stone formation may be caused by high calcium and high oxalate excretion. Calcium phosphate stones are caused by the combination of high urine calcium and alkaline urine, meaning the urine has a high pH. Uric acid stones form when the urine is persistently acidic. A diet rich in purines - substances found in animal protein such as meats, fish, and shellfish - may increase uric acid in urine. Southern Californians who develop cystine stones do so as the result of a genetic disorder that causes cystine to leak through the kidneys and into the urine, forming crystals that tend to accumulate into stones. Since 20-40% of recurrent kidney stones have been associated with elevated urinary calcium, it was originally thought that consumption of high amounts of calcium might cause or contribute to the development of kidney stones. However, established and emerging studies indicate that calcium restriction may increase the risk of kidney stones under certain conditions. Because most kidney stones are made of calcium oxalate, it might seem counterintuitive to consume more calcium and end up with less in your kidneys, but there is theory about why it works...the real culprit is oxalate, not calcium. Oxalate is found in many foods including fruits, vegetables, nuts and chocolate, and calcium binds to it avidly. The more calcium in the digestive tract, the more oxalate that can bind, instead of being absorbed and ending up in the kidneys. Southern Californians who have had kidney stones in the past should try to prevent a recurrence. With shock wave lithotripsy (SWL), x-ray and/or ultrasound guidance is used to concentrate high-energy pressure waves upon kidney or ureteral stones, reducing them to sand-like particles. The fragments are then passed through the urinary tract. Ureteroscopy is an excellent option for treating large, or multiple kidney stones, stones located within the kidney and ureter, or impacted ureteral stones. A thin, flexible instrument called a ureteroscope is inserted directly into the ureter through the bladder. No incisions are made. Some stones can be extracted whole with a device inserted through the ureteroscope. In other cases, where the stone is too large for extraction, a laser is used to break the stone into small pieces, which can then be extracted or passed by the patient. Percutaneous Nephrolithotomy (PNL) is a minimally invasive surgical procedure available in Southern California to treat large kidney stone by creating a small 'keyhole' passage directly into the kidney. Traditionally, at the end of a PNL procedure, an external tube is placed into the passage to ensure proper drainage of urine from the kidney. Patients typically stay overnight in the hospital, with removal of the tube the morning after surgery and discharge soon after. Following complete stone clearance, the small "keyhole" incision can be closed and an internal stent used to facilitate urinary drainage. This eliminates the need for an external tube, thus minimizing a patient's discomfort and any need for post-operative wound care. Following any surgical kidney stone procedure, a key element of a patient's care is the prevention of future stone formation. To achieve this goal, Dr. Gary Bellman may order a comprehensive metabolic evaluation to define your stone risk factors. Thus, preventative regimens can be tailored for every individual. 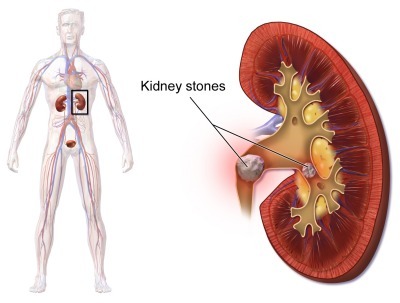 Tests which may be performed as part of a kidney stone patient's medical evaluation include: stone composition analysis, serum stone risk-blood panels, and 24-hour urine evaluations. If you're experiencing waves of sharp pain in your back, side, abdomen, or groin, or if you are having difficult urinating, or any pain when urinating, it's important to contact an expert Los Angeles urologist, who specializes in the treatment of kidney stones. Dr. Gary Bellman is a top kidney stone treatment physician, who will be able to properly diagnose the source of your discomfort, and provide you with the best options for treating your kidney stones, thereby alleviating the pain and associated discomfort.